Many people assume that because I am into nutrition, I am a vegetarian…not true at all! I love eating fish, poultry and meat. I will even eat organ meat occasionally, so I am definitely not squeamish about being a carnivore. However, I am extremely picky about the source. I don’t eat it often, because when I do, I shell out for organic, wild and free-range. It isn’t cheap, but it is so worth it. Not only do I know that I am getting a great source of protein without hormones and harmful chemicals, but I am ensuring that the animals are treated in an ethical fashion. Lately, my new favorite protein is lamb. Lamb is super high in tryptophan, which is a feel good amino acid. Tryptophan gives you that warm snugly feeling after a Thanksgiving meal. Lamb is also high in selenium, B12, B3, Zinc and Phosphorus. Good quality lamb gives you a healthy dose of protein and saturated fats, vital for overall wellness. The vitamins present in lamb are great for stabilizing blood sugar levels and improving metabolism. They are also important for cardiovascular health and your nervous system. I love this recipe because it is so easy to make, even for someone who has never cooked lamb before. Please make sure to buy good quality lamb! Toss the lamb chops with the olive oil, herbes de Provence, sea salt and pepper. Melt the butter in a sauté pan over medium high heat. Add the lamb chops and garlic cloves. Cook until well-browned on one side (see photo above), about 5 to 6 minutes. Turn the chops over and cook 2 to 3 minutes more. That’s it! As always with meat, let it rest for a few minutes before you serve it. *You may choose to make some adjustments to the ingredients depending on what flavor profiles you like (for example, lemon juice instead of red wine vinegar). This sauce goes perfectly with halibut. Amen! Lamb is a major exception to my almost-local diet. I will go out of my way to get it occasionally, as long as it's from a humane and environmentally conscious organic source. Thanks very much for the nutritional info. I had no idea lamb contained triptophan! You always hear about turkey having it, but I wasn't aware that lamb did too. This looks delicious and I am definitely adding it to my recipe box. Can't wait to try this one. I can't believe it is so easy! Mouth watering! 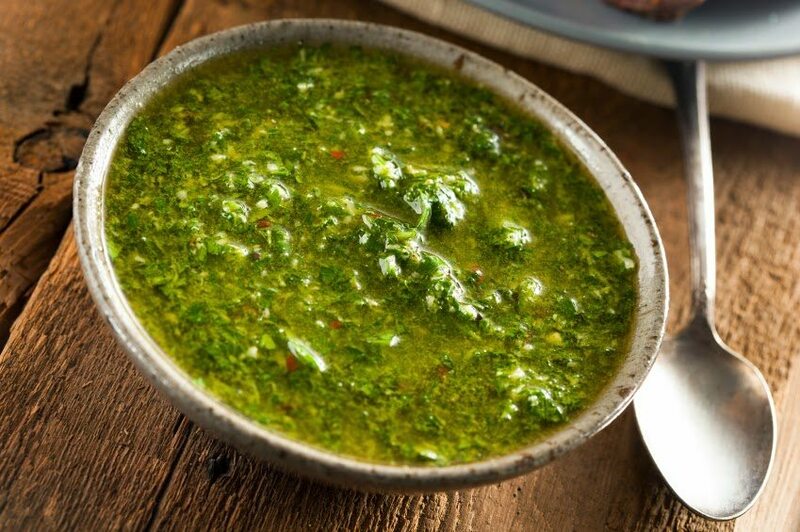 Does chimichuri sauce look like pesto sauce? @The Chickenless Chick: Great, thank you! I agree, the source is so important! And it really changes the flavor too! @Anonymous: Great! It really is that easy! @Coby: My friend just got back from Australia and he said the lamb was delicious! Jealous!!! @Sarah: Not really, more like a dressing. I will post a picture soon! Great question.